Here's my card for the current challenge at CAS Colours and Sketches. 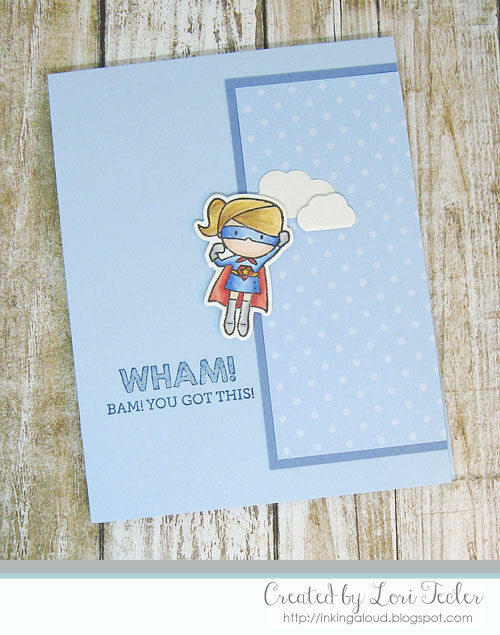 I paired the sketch with the adorable Tiny Heroes set from Mama Elephant for this encouraging design. The superhero image was colored with Copic markers, then cut out with the matching die. I made a background for the image from some blue dotted paper that's been sitting in my scrap pile for a long, long time. The dotted panel was matted on darker blue cardstock before I adhered it to the right side of a light blue card base. The image was added on top, using foam tape for dimension. I added a pair of clouds, die cut from shimmery white cardstock, to fill in the scene. The set's encouraging sentiment was stamped beneath the image in navy blue ink to finish the design. Adorable card! Great job with the sketch! Thanks for playing along with us at CC&S! Such a cute card! Great coloring and an adorable image with a great sentiment. Thanks for joining us this week at CC&S!